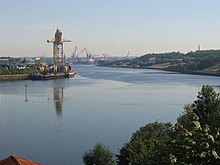 The River Tyne /ˈtaɪn/ ( listen) is a river in North East England and its length (excluding tributaries) is 73 miles (118 km). It is formed by the confluence of two rivers: the North Tyne and the South Tyne. These two rivers converge at Warden Rock near Hexham in Northumberland at a place dubbed 'The Meeting of the Waters'. The Tyne Rivers Trust measure the whole Tyne catchment as 2,936 square kilometres (1,134 sq mi), containing around 4,399 kilometres (2,733 mi) of waterways. The North Tyne rises on the Scottish border, north of Kielder Water. It flows through Kielder Forest, and in and out of the border. It then passes through the village of Bellingham before reaching Hexham. The combined Tyne flows from the convergence point at Warden Rock just to the north west of Hexham, the area where the river's now thriving barbel stocks were first introduced in the mid-1980s, through Corbridge in Northumberland. It enters the county of Tyne and Wear between Clara Vale (in the Borough of Gateshead on the south bank) and Tyne Riverside Country Park (in Newcastle upon Tyne on the north bank) and continues to divide Newcastle and Gateshead for 13 miles (21 km), in the course of which it is spanned by 10 bridges. To the east of Gateshead and Newcastle, the Tyne divides Hebburn and Jarrow on the south bank from Walker and Wallsend on the north bank. Jarrow and Wallsend are linked underneath the river by the Tyne Tunnel. Finally it flows between South Shields and Tynemouth into the North Sea. The late Thomas John Taylor supposed that the main course of the river anciently flowed through what is now Team Valley, its outlet into the tidal river being by a waterfall at Bill Point (in the area of Bill Quay). His theory is not far from the truth, as there is evidence that prior to the last Ice Age, the River Wear did once follow the current route of the lower River Team, merging with the Tyne at Dunston. Ice diverted the course of the Wear to its current location, flowing east the course of the Tyne) and joining the North Sea at Sunderland. The River Tyne is believed to be around 30 million years old. The conservation of the Tyne has been handled by various bodies over the past 500 years. Conservation bodies have included: Newcastle Trinity House, and the Tyne Improvement Commission. The Tyne Improvement Commission conservation lasted from 1850 until 1968. The 1850-1950 era was the worst period for pollution of the river. The Tyne Improvement Commission laid the foundations for what has become the modern day Port of Tyne. Under the management of the Tyne Improvement Commissioners, over a period of the first 70 years the Tyne was deepened from 1.83 to 9.14 meters and had 150 million tonnes dredged from it. Inside these 70 years, the two Tyne piers were built; Northumbrian, Tyne and Albert Docks were built as well as the staithes at Whitehill and Dunston. This infrastructure enabled millions of tonnes of cargo to be handled by the Port by 1910. As of 2019 the tidal river is now managed by the Port of Tyne Authority, and has been managed by the Port of Tyne Authority since 1968. 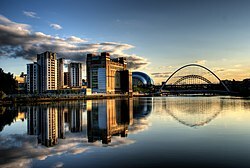 With its proximity to surrounding coalfields, the Tyne was a major route for the export of coal from the 13th century until the decline of the coal mining industry in North East England in the second half of the 20th century. The largest coal staithes were located at Dunston in Gateshead, Hebburn and Tyne Dock, South Shields. The dramatic wooden staithes (a structure for loading coal onto ships) at Dunston, built in 1890, have been preserved, although they were partially destroyed by fire in 2006. In 2016, Tyne Dock, South Shields was still involved with coal, importing 2 million tonnes of shipments a year. 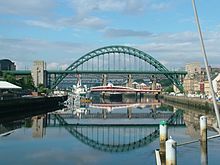 The lower reaches of the Tyne were, in the late 19th and early 20th centuries, one of the world's most important centres of shipbuilding, and there are still shipyards in South Shields and Hebburn to the south of the river. To support the shipbuilding and export industries of Tyneside, the lower reaches of the river were extensively remodelled during the second half of the 19th century, with islands removed and meanders in the river straightened. Nothing definite is known of the origin of the designation Tyne, nor is the river known by that name until the Saxon period: Tynemouth is recorded in Anglo-Saxon as Tinanmuðe (probably dative case). There is a theory that *tīn was a word that meant "river" in the local Celtic language or in a language spoken in England before the Celts came: compare Tardebigge. There is also a river Tyne that rises in Midlothian in Scotland and flows through East Lothian into the North Sea. The River Vedra on the Roman map of Britain may be the Tyne, or may be the River Wear. A supposed pre-Celtic root *tei, meaning 'to melt, to flow' has also been proposed as an etymological explanation of the Tyne and similarly-named rivers, as has a Brittonic derivative of Indo-European *teihx, meaning 'to be dirty' (Welsh tail, 'manure'). 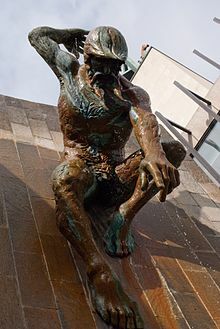 The river is represented, and personified, in a sculpture unveiled in 1968 as part of the new Civic Centre (seat of Newcastle City Council). Sculpted by David Wynne, the massive bronze figure incorporates flowing water into its design. ^ a b Owen, Susan; et al. (2005). Rivers and the British Landscape. Carnegie. ISBN 978-1-85936-120-7. ^ a b c d "Environment Agency - River Tyne Salmon Action Plan Review" (PDF). Environment Agency - APEM REF EA 410230. July 2008. Archived from the original (PDF) on 28 March 2014. Retrieved 17 May 2013. ^ "Facts & Figures". tyneriverstrust.org. 2 June 2013. Archived from the original on 22 June 2013. Retrieved 2 June 2013. The Tyne Catchment covers 2,936 km2 (1,134 sq mi) and contains around 4,399 km (2,733 mi) of waterways. In the language of the Water Framework Directive (which currently drives so much of what is done on rivers) the Tyne Catchment contains 116 river water bodies and 19 lake water bodies. ^ Tyne river trust staff. "The Tyne's origins". Archived from the original on 26 March 2017. Retrieved 30 July 2017. ^ a b c d e f g Port of Tyne staff (30 July 2017). "Tyne Improvement Commission". portoftyne.co.uk. Port of Tyne. Retrieved 30 July 2017. ^ "Coal heritage goes up in flames". bbc.co.uk. 20 November 2003. Retrieved 25 August 2008. "The staithes is a lot more than just a lump of wood in the Tyne, it is a magnificent structure and very important to the area's industrial heritage. ^ a b "The Brittonic Language in the Old North" (PDF). Scottish Place Name Society. ^ Usherwood, Beach & Morris (2000). Public Sculpture of North-East England. Liverpool University Press. ^ a b "Tyne Salmon Trail". 2008. Archived from the original on 7 August 2008. Retrieved 22 August 2008. Ten cubes inspired by the textures, changing colours, movement and journey of the salmon will migrate along the River Tyne, following the amazing journey of the salmon. ^ Strug, Leah (21 July 2008). "Attraction's sending art lovers fishy messages". South Shields Gazette. Leona J. Skelton. Tyne after Tyne: An Environmental History of a River's Battle for Protection, 1529-2015. Winwick White Horse Press, 2017. ISBN 978-1-874267-95-9.